Rather like the Christmas music chart number one being a coveted position, the same principle is applied to video games - in the UK, at least. Securing top spot in the final results prior to 25th December is an extra gong to celebrate, a string for a publisher's bow. Somewhat predictably that honour falls to Call of Duty: Black Ops III this year, and from Nintendo's perspective there was no late UK surge in sales, at least not compared to its rivals in the market. Evergreen titles did hold their positions, however. Mario Kart 8 is still the top performer for Nintendo, securing 27th place (a fall of three positions) in the all-format results; the close proximity of Splatoon - yet again - in 29th suggests that the combined hardware bundle for both may be a decent source of those sales. Super Mario Maker holds onto 34th place, same as last week. Animal Crossing: Happy Home Designer is the only 3DS game in the all-format top 40, grabbing 36th place. Meanwhile Just Dance 2016 on Wii - again, not on Wii U! - continues to shift some copies, grabbing 26th in the single-format chart. The Wii U version of the dancing game did grab fourth in the console's own chart though, and in an oddity that's probably tied to discounts and bundles Mario & Luigi: Dream Team Bros. outsold its successor on 3DS, Mario & Luigi: Paper Jam Bros..
That brings to an end an underwhelming Holiday sales period for Nintendo UK, in which sales for the country struggled to make an impact on the charts. I wonder, are the MK8-only bundles still sold? Or are people really still buying MK8? Because after all, it still sells a bit more than Splatoon! Other than that, Mario & Luigi: Paper Jam Bros. is in a really gruesome situation, and I hope this won't negatively impact AlphaDream. 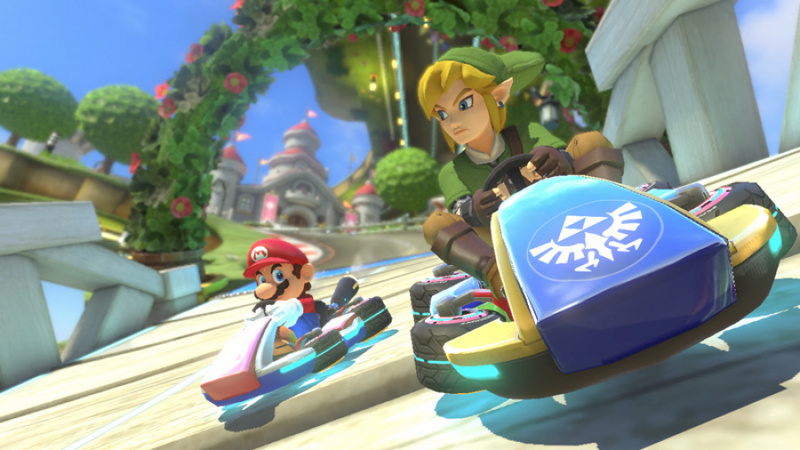 @Mister_Wu MK8 is still the go-to game. Splatoon is relatively unknown. Not that I'm one for really caring about sales, but it can be quite frustrating when some things, whether it's games or consoles can really be so good but not get the recognition they deserve. And as someone who is in Cambridge in the UK, it is even more annoying when I go to my two local GAME stores, their Nintendo selection is abysmal; but yet if I go shopping to Milton Keynes, which is just 45 minutes away from me, their local GAME store has an incredible Nintendo display. Seems different towns care about it more than others. In Target yesterday there were 10 boxes of Lego Dimensions (yes I counted) starter packs - 8 Wii U, 1 Xbox360, 1 PS3. So either Target didn't think it would sell on PS4 or Xbox One so it ordered only Wii U and last Gen versions, or the Wii U version just isn't selling. And I still don't see why the Super Splat bundle was so limited. Even I was coming around to thinking Nintendo was pushing Wii U this holiday with that bundle for $249. The Mario Kart 8 bundle at $275 makes me think they've given up. It's OK to offer a cheaper price for BF, but that 2 game bundle is a better offer than 1 game obviously, and all I've seen in stores are the MK boxes. Best Buy had over 200 boxes sitting in 2 piles. Looking forward to 2016 and putting this year behind. It's not surprising, I've not seen much push for sales from Nintendo. I've still seen absolutely no advertisements for the recent big game Xenoblade Chronicles X. Also, Europe is missing some big titles that the US has such as Yo-Kai Watch. If you go into any shop selling video games in the UK Nintendo is either hardly featured or not even on the shelves , Most are dominated by xb1 and ps4 . I think the retailers are just shallow sell outs and are just as much to blame for the problems in the UK Market , The only place i've seen make a bit of an effort for nintendo is ToysRus. I would like to see who is also buying ps4 and xb1 games in store except day 1 buyers and pre orders as most GAME and other video game sections are dead , I rarely see many people in GAME or around any video game section in a store. The problem though is GAME and other retailers are proving that the market itself is shallow and based on hype and gimmicks and this is the future unless you support Nintendo and the indies. Where's devils third its amazing! What can i say? The British just love dull shooters and sports. It's the same everywhere in western countries. The Japanese must be laughing at us in stupidity taste in games like Black Ops 3. Alright results, but nothing spectacular, Nintendo is going down the drain here, and no-one cares or gives a damn for Nintendo anymore. Yep, nothing says Xmas more than a good running and gunning gaming session, eh? @Mister_Wu this could have an impact on Alpha. A Score of 8/10 for a Mario game of this type is low. But sometimes these reviewers over analysis the games and start to knit pick. I enjoyed Sticker Stars and have Paper Jam under the Christmas tree. I think it will as good as Sticker Stars, which should have scored higher. Modest? I would say disastrous sales instead. Too bad Nintendo on the UK is as relevant as... a flip phone. @zool Honestly, if we consider that the development time was short (pretty much 2 years since Dream Team), that the Dream team engine was reused, that Mario & Luigi: Paper Jam is the first Mario RPG that doesn't introduce new characters nor enemies (even Sticker Star introduced Tower Power Pokey and some other bosses!) and that the settings are the common ones as well, not to say that we have Bowser kidnapping Peach again, the scores this game got just show that the people at AlphaDream are really skilled developers! Unfortunately, in the marketing material the shortcomings were evident while the positive aspects (e.g. the characters all having a more interesting personality this time, many of the often talked-about problems of Dream Team being addressed and so on) were not, and since Sticker Star appears to have left quite a few people burned, I would say that there were quite a few reasons why not many people dared to buy this game. @JosieC84 Have you played BO3? @shigulicious I have it and he's not that far off but to each their own I guess. Hmmm, heres a thought... instead of posting just the UK sales, show the German and French markets also. I understand that the UK is the largest singular market in europe, but the other big euro nations combined exceed the UK sales (vgchartz)... if nothing else it paints a nicer picture then the doom and gloom of just the UK market. @firstnesfan yes. To each their own indeed. That is the message I wanted to convey. @shigulicious no not really and why should I? It's just the same multiplayer experience as the other Call of Duty games with a different skin. No matter how much new stuff they add in, it's still the same. The campaign I don't really care about either. I prefer to play shooter games like Plants VS Zombies Garden Warfare because it's different and you feel like part of a team. MAG - now that was an awesome online FPS game as you felt part of the family and everyone respected each other. No alarms and no surprises there. You can't have a dismally poor release schedule (the odd exception aside) and almost literally no marketing and expect to sell. No surprises since the lack of games. A bit sad for the poor performance of XCX, the game is a true gem and deserve much more popularity. Also the console price is still too high considering the lack of software and popularity amd the aggressive recent sales of xbox and ps4. Dont understand the people blaming stores for Nintendo's poor sales. They sell what people buy. Its a business. No one was buying the vita so they stopped selling it. Same with Wii U. It is why most Nintendo sections are filled with Amiibo as that is what sells. It is entirely Nintendo's fault. They made some poor decisions over the last few years and this is the result. I hold my breath for the NX hoping it does something truly worthwhile to capture the wider demographic, outside current Nintendo fans. What's more, Just Dance is a series that keeps selling well after its launch. So you might see Just Dance 2016 and especially the Wii version popping up in charts even in March 2016 and further. Well there is a surprise! With zero advertising spend, what else could have been expected? Weirdly the only mention of WiiU in adverts has been a tiny logo on the Minecraft advert and Just Dance. WiiU owners outside of NintendoLife probably don't even know about Xenoblade X, never mind the wider public (enjoying Xenoblade much more than I thought btw). Sadly unless Nintendo gets its act together and understands basic marketing concepts, the NX will end up going the same way as the WiiU. I wish more people would buy Xenoblade,And Wooly World for that matter.